Today on December 16, in 1770 a German composer and pianist that became the most crucial figure in the history of music was born. This was Ludwig van Beethoven! It’s really hard to describe the life and work of this enormous musician and composer in just a couple of paragraphs. So we just write a few very generic words about him. Beethoven was the grandson of Lodewijk van Beethoven (1712–73), a musician who came from Mechelen in present-day Belgium who moved at the age of twenty to Bonn. So Ludwig was born in Bonn, then the capital of the Electorate of Cologne and part of the Holy Roman Empire. He displayed his musical talents at an early age and was taught by his father Johann van Beethoven and Christian Gottlob Neefe. During his first 22 years in Bonn, Beethoven intended to study with Wolfgang Amadeus Mozart and befriended Joseph Haydn. Beethoven moved to Vienna in 1792 and began studying with Haydn, quickly gaining a reputation as a virtuoso pianist. He lived in Vienna until his death. During the late 18th century, his hearing began to deteriorate significantly, yet he continued to compose, conduct, and perform after becoming completely deaf. He died on 26 March 1827 at the age of 56 during a thunderstorm. His friend Anselm Hüttenbrenner, who was present at the time, said that there was a peal of thunder at the moment of death. An autopsy revealed significant liver damage, which may have been due to heavy alcohol consumption. But there is dispute about the cause of Beethoven’s death. Everyone now probably sings inside him the scope from the fifth or the ninth symphony. Well… after almost 300 years his music power still exists! Some paper ideas from the same date from the past! Charles I and Hirohito. What do they have in common? What happened on November 19, 1928 exactly 412 years ago? Or even 84 years ago? Charles I was the King of England, King of Scotland, and King of Ireland from 27 March 1625 until his execution in 1649. Charles was born in Dunfermline Palace, Fife, on 19 November 1600. Charles was accused of treason against England by using his power to pursue his personal interest rather than the good of England. So, the King was declared guilty at a public session on Saturday 27 January 1649 and sentenced to death. The execution took place at Whitehall on a scaffold in front of the Banqueting House. I’m sure you’re capable enough to find some of the King’s paper items! On the other side of the Atlantic, in the same exact date – well some centuries later – TIME magazine on 19 November 1928 presented its cover in color for the first time. The subject was another monarch: Japanese Emperor Hirohito. Hirohito, officially called in Japan Emperor Shōwa, was the 124th Emperor of Japan according to the traditional order, reigning from December 25, 1926 until his death in 1989. You can find a lot of paper items original or reproductions on these two topics. 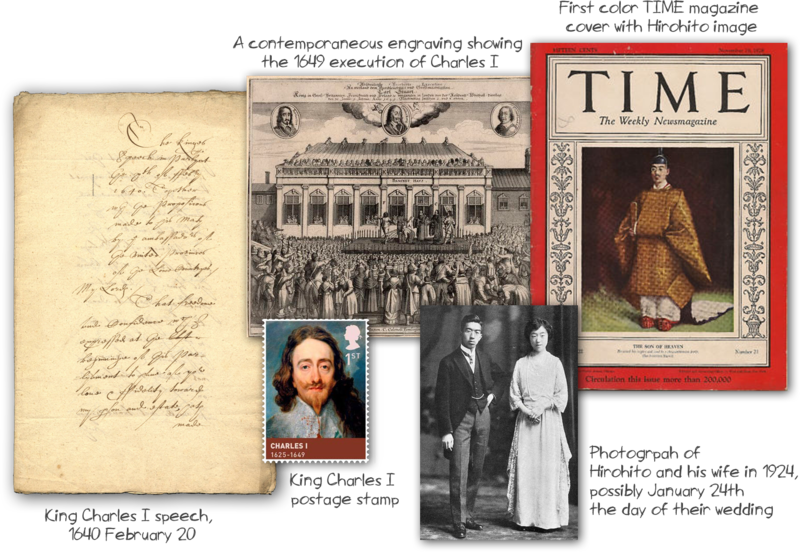 Well, probably not Charles I manuscripts but you can make it for the TIME magazines! Many people collect manuscripts, engravings, magazines and postage stamps. It’s really fun to collect!